Certain words collocate with others, meaning they often occur together, and therefore become associated with one another. A relatively common collocation with ‘searing’, for example, might be ‘flesh’. Fire and flesh are the dominant elemental forces at work in Shahidul Alam’s photographic series, Kalpana’s Warriors, exhibited at Breeze Creative’s Abject Gallery from Friday 1st December until Thursday 11th January. 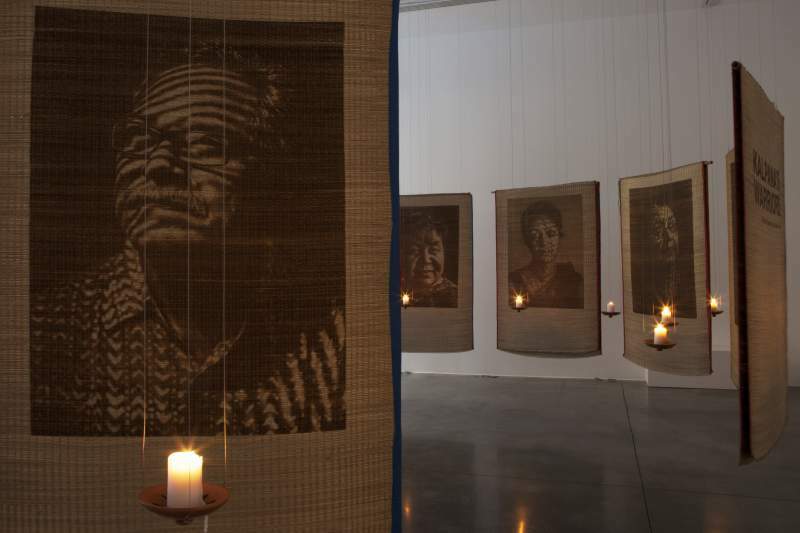 The photographs are literally seared onto straw matting using lasers, a potent and sensual reminder of the violence exacted by Bangladeshi state forces against the indigenous peoples of the Chittagong Hill Tracts. Often, entire villages were burnt to the ground. Kalpana Chakma was an active campaigner for the rights of Pehari people and Bangladeshi women. 20 years ago, at the age of twenty-three, she was abducted at gunpoint, and has not been seen since. In his photographs, Alam portrays those members of the community who keep fighting the causes for which Kalpana gave her freedom, and quite possibly her life. Each portrait is lit by a candle, reclaiming the destructive element of fire. Poignantly suspended and ambivalent, like Kalpana’s unknown fate, these candles aren’t sure if they are keeping hope burning or if they are memorialising; perhaps they are doing both. The violence and the subterfuge of the Bangladeshi forces mean that the story of Kalpana Chakma and the Pehari people is in danger of being a tragedy without catharsis. Shahidul Alam’s work hopes to save it from this fate. Another common and powerful collocation: searing honesty.